If you regretted having a tattoo that reminds you the lack of aesthetics or a bitter memory about a person, you might either wound up having a laser removal or conceal it with cover up tattoos. Either way, they can be as effective as you want it to be. However, laser removal costs a princely sum of money compared to cover up tattoos so you might want to give it a thought first. If you are on budget yet you have a new tattoo design idea, you should go for cover up tattoos. Keep in mind though that they usually come in large sizes because to cover up a former tattoo will take a lot of coverage around your skin. In some cases, you can still see small traces of the old tattoo in the cover up tats. This is considered quite normal though because there are instances when the cover up tattoo must be painted with very dark and bold colors; thus, it can cause a scarring effect on the old tattoo. This obviously puts a distinction between tattooing on a blank patch of skin and a skin that has already been inked. 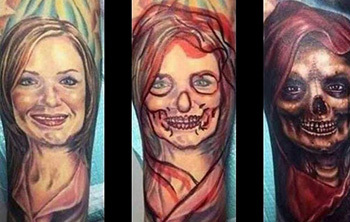 When having a cover up tattoo, the new design must be three times larger than the original one. The design should be able to accommodate a large volume of black shading and can cover a wider coverage. With that, you must not get a tribal tattoo design as a cover up as it will not simply work. Custom made designs are an ideal option, but you can consult any design of your choice to a seasoned tattoo artist, or even to a cover up tattoo specialist. 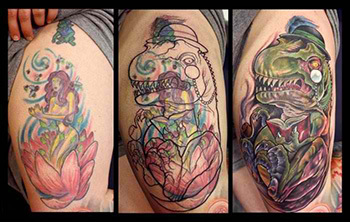 As for the choice of colors, cool hues like green and blue work well with most cover up tattoo designs. This means you should stay away from warmer colors like red and yellow as they don’t provide enough dark pigmentation to cover up a black or heavily colored tattoo. Artists will usually make up to third layer of coating over your old tattoo, to be able to conceal it completely despite how dark it is. This is why patience is also the key to putting up with having cover up tattoos. How does cover up work? How is cover up done? 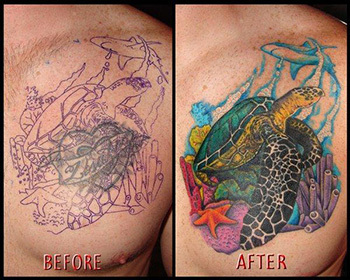 Your tattoo artist will first make an outline of your old tattoo. This can be done by using a tracing paper placed on top of the tattoo that needs to be covered up. It will then be put on a table where the artist will use another paper placed over it to see what can be done with it. The next process will commence after the artist has figured out the new design appropriate for the cover up. The new tattoo should affect a great camouflage over the original one. Some really talented artists will find a way to incorporate the old tattoo in the new design rather than eradicate it. This can be achieved by drawing lines that evoke petals, flowers, growing buds or vines. First and foremost, understand that not all of these cover up tattoo ideas may work for you. 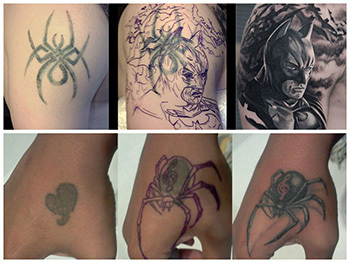 It is highly advisable to seek the expert opinion of a professional tattoo artist first before closing the deal. 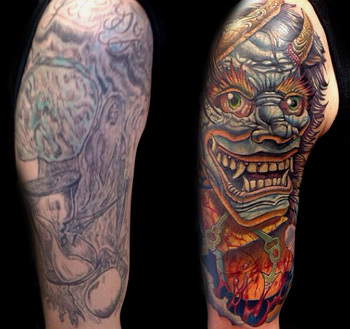 These examples will give you a concrete idea on how cover ups work and how you should design your new tat. This one is a difficult one but it is nevertheless possible to achieve. You can turn the portrait of your ex into the face of Death, besides this figure will show how much you feel about the past; that feelings have been long gone and you’ve moved on. Another way of covering up a love-themed tattoo is by replacing it with another image of something or someone you love. Take the picture below as an instance. You can even replace the name tattoo of your ex by following the same image concept. Like these examples, you can absolutely take that spider image out of the picture and have it replaced with the face of the Dark Knight, Darth Vader, or another spider. Any image of a figure in black might actually work so go figure. Some people just couldn’t help but love hello kitty, little mermaid and other Disney princess perhaps, but growing up, they probably realized that those tattoos are no longer representative of their interests and hobbies. The example herein is undeniably made by a creative artist because he/she was able to cover up a mermaid with a fierce dinosaur without the need to completely change the outlines of the figure and its supporting details. This simply illustrates what a cover up is all about; a camouflage. Overall, cover up tattoos should be more colorful and bolder than the original one to be able to completely conceal what’s beneath it. But the design doesn’t need to be so detailed and decorative. Besides your old tattoo have received much exposure to the sun and perhaps laser machine(s) that would make the covering up a lot easier. Also, expect cover up tattoos to be expensive but you can make the most out of it by choosing the right tattoo professional and design.